The Pudukottai by-election is likely to be a cakewalk for the ruling Jayalalitha led AIADMK, as the main Opposition DMK of Karunanidhi has decided to boycott the poll, saying that opposition parties would not get justice from the Election Commission, reported the Hindu. Political analysts said in the Pudukottai area AIADMK candidate Karthik Thondaiman is so popular that even an election took place he is sure of getting a hands down victory adding a new embarrassment to Karunanidhi who is bogged down with all kinds of crisis including revolt in his family and the 2G Spectrum Scam. So they alleged the allegation against the Election commission is a pretense and a red herring. The election will be held on June 12 and the AIADMK has very much in advance announced Karthik Thondaiman as its candidate. “The seat fell vacant following the death of CPI MLA P. Muthukumaran, representing the constituency. He was killed in a road accident on April 1. “When the State executive committee of the CPI also decided to keep away from the fray, it appeared that there would be two-cornered contest, in which the ruling AIADMK would lock horns with its archrival DMK. “But DMK president M. Karunanidhi on Thursday announced his party’s decision to boycott the election, alleging that there was nexus between the ruling party and some in the Election Commission and the Election Commission announced the date for election only after consulting the AIADMK. “Hours before the Election Commission announced the schedule for the by-election to the Pudukottai Assembly constituency along with 25 other constituencies in different States and a Parliamentary constituency in Andhra Pradesh, the ruling All India Anna Dravida Munnetra Kazhagam (AIADMK) named Karthik V.R. Thondaiman as its candidate. Polling will take place on June 12 and the counting of votes on June 15. “The by-election was necessitated by the death of Communist Party of India MLA S.P. Muthukumaran, who was killed in a road accident on April 1. In the 2011 Assembly elections, the CPI won the seat with AIADMK support. 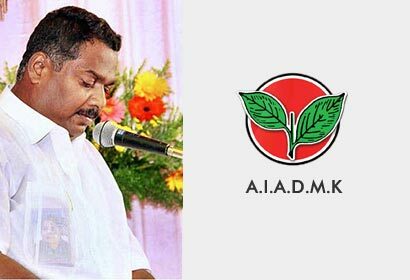 “The candidature of Mr. Karthik Thondaiman, Pudukottai Municipal Chairman, was announced in a release issued by AIADMK general secretary and Chief Minister Jayalalithaa. “Hailing from the Thondaiman family, which ruled the erstwhile Pudukottai princely state, the 42-year-old Mr. Karthik Thondaiman is the district MGR Youth Wing leader. “He is the son of Rajakumar Vijayaragunatha Thondaiman, who was elected to the Assembly from the constituency in 1967, 1977 and 1980 on Congress ticket. “Last year, the junior Thondaiman was elected Chairman of the Pudukottai Municipality, defeating the DMK nominee by a margin of 12,673 votes. “By announcing Mr. Thondaiman’s candidature, Ms. Jayalalithaa took the lead again, as she did for the Sankarankovil by-election, in naming her party’s nominee well ahead of others. “The total number of electors in Pudukottai is 1,92,314, of whom men account for 96,087 and women, 96,227. “A couple of weeks ago, the Chief Minister had announced in the Assembly a Rs.50-crore special development package for Pudukottai Municipality to mark of its 100th anniversary. “On Tuesday, Dravida Munnetra Kazhagam president M. Karunanidhi had said that the government had begun election work in the constituency.